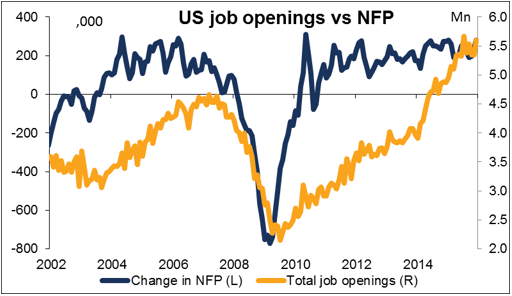 13:30 GMT US non-farm payrolls (Feb):It’s NFP day! The biggest economic indicator of the month, as the market assumes that the Fed is looking closely at this indicator to judge whether to raise rates further. Personally, I don’t think employment is much of an issue for them. 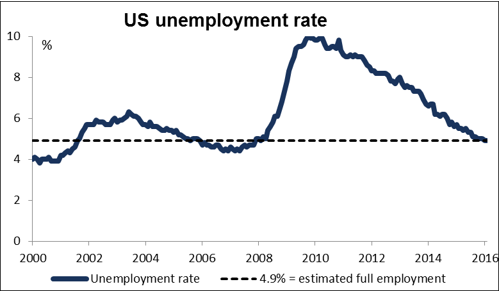 Looking at their forecasts in December, they estimate the long-term level of unemployment to be 4.8%-5.0%. It’s 4.9%, i.e., exactly at its long-term level. In other words, they think this is about as low as unemployment can go sustainably. That means they’ve hit half their mandate – full employment – and should be focusing on the other half – stable prices. So in my view, the inflation data should be more important than the employment data. But people don’t necessarily see it that way. In fact, the unemployment rate could even go up as the labour market improves and draws more unemployed people back into work. That would be a normal response and nothing to get excited about. Some FOMC members have even raised the possibility that the NFP figure could start to fall as the labour market tightens and it gets harder for companies to find workers. Great Analysis,Does anyone have any idea to trade today?